Stat of the day: Of the trainers with at least four wins at the current meet, Jose Corrales is the only one averaging a double-digit win payoff when he scores; his four winners have returned an average of $13.05 per two-dollar win bet. The 4-5 favorite in the lid-lifter is #5 Hail the Queen, and if she repeats her last (and the speed fig is correct), she’ll be a handful in here. But – and there’s always a “but” – there are a couple of negatives here. For one thing, she ripped off a 63 Beyer against $25,000 starter foes while winning that last by a couple; that speed fig will generally win a first-level allowance for sophomore fillies at Laurel at this time of year, but trainer Cal Lynch wheels her back not in tougher company but against easier. We’ll try to beat her here, and the logical player to do that is #3 Starr Designer (9-2); these two runners actually have already met, on December 15, with Starr Designer coming from the clouds to get up late. She’s been working steadily since and, with an added furlong, may have a chance to be a bit closer to the action early in this one. Maybe we’re grasping at straws here in R2, a pretty competitive nickel claiming event, but it feels like #5 Vinny Gorgeous (6-1), making her third start off a six-week break, is moving towards an improved effort in here. In her return from the break, she showed little, but in her follow-up — at 38-1 — she rallied willingly to earn the place spot. The last time she entered a race off a similar sequence, she won back on November 8. There’s not a ton of speed here, so she probably won’t have quite as much to do late as she did in her last at seven furlongs, and trainer Dorothy Worton will leg up her main rider, Rosario Montanez (23 percent strike rate together). Pretty good try last out for #3 Gallinella (5-2), rallying into fourth — beaten less than three lengths — in maiden special weight company. The Jeff Runco trainee finds herself against a little bit easier group today and should be able to graduate against these. One horse worth using, at least underneath in this spot, is #2 Cover Photo (15-1); the Mike Maker trainee didn’t show a thing in her debut and was eased in an Aqueduct maiden, but he chooses not to drop her too precipitously here and will leg up journeyman Horacio Karamanos. Maker is 5-for-16 at Laurel. The fourth presents a short — but quality — field in a third-level allowance, and the favorite here, #4 She’s Stunning (8-5), should be tough. She loves this six-furlong trip (6-for-15), and two back at Laurel, she won at this level. Last out she ran second in an open allowance at Parx Racing, and the winner that day — Ms Locust Point — was 2-5 and is a graded stakes winner. She also looks to sit a winning trip and is the lone mount on the card for regular pilot Dexter Haddock. In her last, #2 Spring Run (2-1) ran her second bang-up race in a row, proving her two-back maiden score was no fluke. 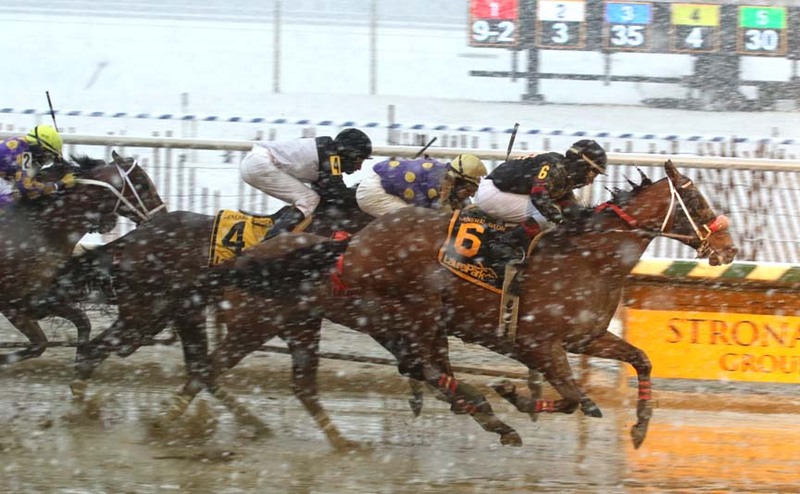 A repeat of that last might well be enough to knock off this Maryland-bred allowance condition, but we’re going to try to beat her in here with #1 Velocita Brillante (7-2). This miss makes her first start in the powerful Claudio Gonzalez barn and arrives off a nice win in $25,000 never-won-two company. Her two prior route tries are good enough, and we like the confidence with which Gonzalez is handling her in moving her up to allowance company off the claim. Last out was a stellar return to the races for #4 Pikachu Princess (2-1); after nearly a year away, she returned with a dominant win, and the runner-up from that event retured to score next out. She’ll make her first start for trainer Jamie Ness, who dropped the claim on her despite the lengthy break, and if she can move forward, she’ll have something to say about this race. #5 Honor Run (5-2) ran pretty well to be second last out to be second against $25,000 maiden claimers and certainly rates consideration in this spot. But there’s not great value there in a horse that’s already lost this race twice. Offering better value is #3 Tizprocess (6-1). Back in July, this Tizway colt debuted with a runner-up effort against this level. He’s been away since but returns here. Notably, trainer Jamie Ness sees fit to protect him, rather than expose him to being claimed, and Ness sports an 8-for-31 record with horses coming back from layoffs of five-to-seven months. Three scratches may have an impact on how the eighth, a $16,000 claimer, shapes up, but it still feels like a race with plenty of horses that will want the early lead. If so, who’ll be running late? Our take is that it’ll be #6 Dr Bolt (6-1); the good news with this runner is that his figs are good enough, he’s dropping from tougher company, and the race shape figures to be in his favor. The bad news: the Laurel track has been pretty kind to speed of late, and this guy possesses an unsightly 0-for-12 mark at the trip. So if you’re inclined to use him, demand value; otherwise, look for one of the speed horses, particularly #7 Tale of E Dubai (9-5) or #1A Shoe Loves Shoe (3-1), to hang on. The ninth may be a race to eat the chalk with #5 Young American (2-1), who has won four of five against lesser and just missed last out against slightly better. Certainly he’s a user in this spot, though it’s worth noting he’s won just once in six tries at the one-mile trip. Another formful sort — something of a rarity in this type of “haven’t won one in six months” company — is #3 Promote (6-1). The six-year-old has won two straight and makes his first start since being claimed by Jonathan Maldonado (who has a solid record off the claim). Jorge Vargas, Jr. — 40 percent at the meet thus far — will ride.